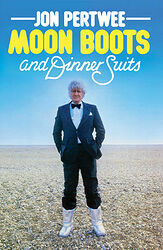 Note: First volume of Jon Pertwee's memoirs, covering his early life — i.e. before his time on Doctor Who. The "sequel" I am the Doctor covers his Who years in more depth. Also available as an audio reading. In 1938 came Jon's first radio role in the BBC's Lillibulero, in which year he also appeared in his father's play, To Kill a Cat, directed by Henry Kendall at the Aldwych Theater. When war came he joined the navy, ramming Douglas Pier with an Isle of Man Steam Packet boat. He was blown up twice, once being put on a marble slab presumed dead, and spent many months stationed in the Scapa Flow. He was the the founder of the Service Players in the Isle of Man. he was commissioned in the RNVR and transferred to Naval intelligence where he worked and became good friends with future Prime Minister James Callaghan. Then Jon joined Naval Broadcasting. His series, The Navy Lark, ran for eighteen years and produced some truly vintage memories of radio. 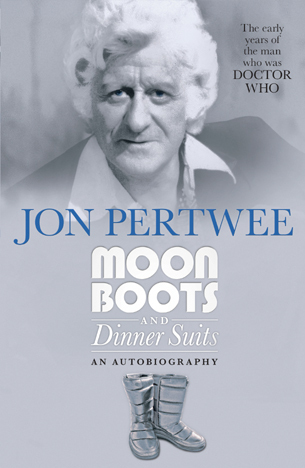 Whether telling stories of a misspent youth, of his posterior's first introduction to a fives bat or his exploits with the McKenzie sisters in the north of Scotland, Jon Pertwee's humor and natural wit never fail him. 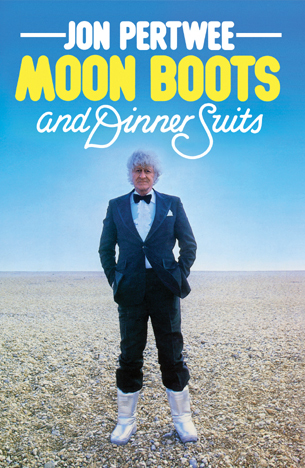 Moon Boots and Dinner Suits is a wry, funny and endearing portrait of the early years of a most innovative and well loved actor. Note: Numbered limited edition of 250 copies, only available from the publisher. 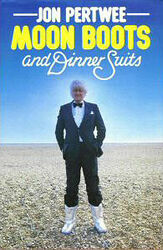 Contains exclusive photo section (plus the same "retro" cover design as the original 1984 edition). Jon Pertwee's acting career began with a public performance at the age of four. He seems to have been expelled from most schools his actor-writer father Roland Pertwee sent him to and finally joined RADA in 1936. From there too, he was asked to leave. Jon went into Rep and had a chequered career. In Brighton panic set in when he dressed as an old gardener in Love from a Stranger instead of as a young cleric in Candida.